Well I have completed Level One of 30 Day Shred. I'm glad that I'm onto the next round, it was started to get a little boring. When I can quote the "motivation" that Jillian is about to spout off, it's time to move on to the next one. There was a noticeable difference in my endurance from Day 1 of this Level. What I have learned from this set is (1) I hate, hate, pushups and (2) Anterior Shoulder Raises are my arch nemisis! Even so, I was still getting better as those also. Last night I took pictures for comparison and took my measurements again. My measurements were pretty much the same but with the pictures I could see a little difference. It wasn't significant by any means but just enough to show me that it's doing something! I can't wait to get to the end and see the results. 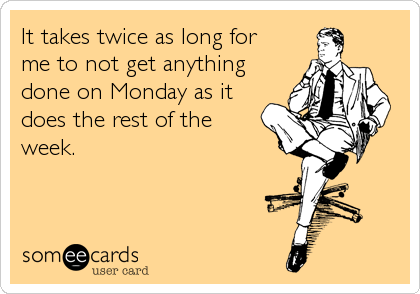 Monday, Not-So-Fun Day again. This is my busy week at work, first since being back, which means Dad is on Henley duty. I'm hoping not to work past 6:30/7:00 but we will see. Hoping for the best. I hope your Monday is awesome!